40+ Years With A 1974 Triumph Toledo 1300 “HL”: There’s Seldom Been a Dull Moment! During the first-half of 1975, my father, my mother and myself, investigated various car models as a possible second family car, in addition to my father’s then GP practice runabout (a Fiat 124 Special T Automatic), which would be better suited for family outings and could otherwise be driven by myself (having passed my driving test the previous summer, in early-June 1974) and my mother who was then learning to drive, but never managed to pass the driving test, despite several repeated attempts. Lastly, we examined the 4-door, Triumph Toledo 1300 models, which were displayed at Mann & Egerton, in Leigh-on-Sea, Essex, who were then the local BLMC Rover & Triumph dealership. At that time, the list price of new Toledos, had recently been increased to circa £1800 and I wasn’t greatly enamoured with the bodywork colours (especially the brown), of the new cars on display. ·	Radiomobile 1070 mono radio (four medium-wave & one long-wave pre-set buttons) & single speaker mounted in a central console. This car which was on sale for £1500, was said to have been used as a runabout by the managing director’s wife. First registered on 15th November 1974, with only 4,133 miles on the odometer, this seemed a much more attractive proposition and was the car my father ultimately purchased on 15th May 1975. At that time the Toledo was classified as being in Motor Insurance Group 2; the second lowest rating for insurance premiums. Before taking delivery, there were a few faults that needed to be rectified; a not uncommon occurrence with BLMC cars in those days! My father also requested that reversing lights be retro-fitted. At least one of the doors and the boot lid were poorly aligned, causing paint to be abraded by rubbing surfaces. Hence these needed to be realigned and the paintwork made good. I discovered much later, that one of the heater-control levers was incorrectly positioned and consequently was scraping away the slot edge of the dashboard’s plastic three-slotted, control-lever trim panel. The Cosmic alloy wheels were retained by the original nuts intended for the factory-fitted 13 x 4½ inch steel wheels, but these didn’t fasten completely onto the hubs’ threaded studs, leaving some of the nuts’ internal threads exposed; a far from satisfactory situation. Chromium-plated tapered nuts were substituted. As it was our intention, to undertake most if not all of the Toledo’s maintenance ourselves, we ordered from the parts department, a copy of the official BLMC loose-leaf Triumph Toledo manual (brown, four-ring file | Triumph Part No. 545168). When we returned to Mann & Egerton, to take delivery of the car, we discovered that the owner’s operating handbook was missing and there was no documentation pertaining to the car’s service history. An appropriate “spare” Toledo operating handbook was quickly found, together with a new Triumph PASSPORT TO SERVICE booklet, but as a consequence, we had nothing to indicate whether PDI – pre-delivery inspection, 1,000 mile service and 3,000 mile service had been completed. Hence, the car does not have an FSH (i.e. Full Service History), but over the period that it was in continuous service, from May 1975 to mid-1999, it was probably better and more regularly maintained than most other cars. I undertook the Toledo’s first recorded 6,000 mile service at an indicated mileage range of 5,988 to 6,056 miles, during the period 8th to 27th June 1976. In the past, my father had expressed a fondness for the Triumph Herald & Vitesse, but said that the rear wheel-arches which intruded into the rear passenger cabin, had put him off buying one. During our late-October 1968, 10-day holiday in Malta, I had seen several locally-assembled RHD Triumph Heralds, bearing a Maltese Cross emblem rather than the Triumph emblem. I have since learned that after the Triumph Herald was discontinued, RHD Triumph Toledos were later assembled in Malta, of which I recently came across one still in Malta, being advertised for sale (Tel. +356 79400876 or E-mail: youzevz@gmail.com) on the Internet; which until recently had been in the hands of a single owner for 41 years. It was also said that it would cost approximately £350 to ship it to Great Britain. For our December 1969 holiday, my father had booked a fly-drive package holiday in Cyprus, which involved pre-booking a minimum number of nights’ stay, at a choice of various specified hotels, plus pre-booking a hire-car, selected from one of various price categories. For reasons of size and comfort, for my father, mother and I, we chose to have the luxurious FWD Triumph 1300. Although the car more than adequately served our needs, both the battery and the engine’s cooling system needed regular topping-up, on an almost daily basis; something we attributed to the poor maintenance of hire-cars, rather than any inherent fault in Triumph cars. Independent tutor of mathematics, physics, technology & engineering, for secondary, tertiary, further & higher education. Last edited by naskeet on Wed Jul 25, 2018 3:28 pm, edited 9 times in total. An interesting car, I think probably one of the Mann Egerton dealer modified "run out" models. ISTR someone showing a newspaper ad for a similar car in a thread on here a year or two ago. Be nice to know at least one still exists! In 74, the Toledo's fate was already sealed along with the 1500TC in the Dolomite range rationalisation which actually took place in 76. Nigel, I've moved your thread here because it is definitly Dolomite-related (I know it's a Toledo). Nigel, I've moved your thread here because it is definitely Dolomite-related (I know it's a Toledo). That's okay, it's partially a Dolomite anyway, having undertaken a few choice upgrades over the years! There's much more to come, when I get around to compiling it. Fantastic history and excellent sounding car!! Can't wait to watch progress and of course to see some pictures!!! Three features of the Triumph Toledo which particularly appealed to me were: (a) the comfortable driving position; (b) the ergonomically designed, combined heating & ventilation system’s three vertical control-levers, whose operation is intuitively simple; and (c) the boot lid extended down to the bottom of the boot floor, level with the upper surfaces of the fuel-tank & spare-wheel covers. As a learner driver, I had sometimes driven my father’s 1972 FIAT 124 Special T Automatic, for the purpose of gaining additional experience. Sadly, it was a car whose driver’s seat caused me to suffer severe back ache after only half an hour. I suspect that this might have been because the car was designed for Italian drivers, with short legs and long arms!?! A new Mazda 323 that I tried for size at the local showroom, had poor range of fore & aft adjustability for the driver’s seat and the position of the steering-wheel, was such that I would knock my right knee against the steering-wheel-rim, when moving my foot from accelerator to brake. I later encountered the same knee-knocking problem in 1988/89 on the few occasions I drove a Vauxhall Astra Mk.1 and during the same period when driving a Vauxhall Astra Mk.2, my left elbow knocked against the driver’s seat-back, when selecting 2nd or 4th gear; both of which I found rather annoying. These were my employing company’s two pool cars, which I needed to use when out on technical-consultancy visits. Let it suffice to say that I tried out several British and foreign cars, all of which I found sadly lacking with respect to driver comfort and other aspects. The Triumph Toledo was the only affordable car at that time, in which I didn’t experience discomfort or need to contort my body in some way, in order to drive it! Of all the cars and vans I have driven over the years, the Triumph Toledo’s (and similarly the Triumph Dolomite’s) heating & ventilation system’s controls, are by far the simplest to understand and use. Their position in the centre of the dashboard makes them easy to find, even at night. I cannot remember what the boot access was like for my father’s Morris 8 Series E, but all his other cars (1964 VW Beetle, 1968 Daf 44 Variomatic, 1972 FIAT 124 Special T Automatic, 1977 Honda Civic 1500 Automatic, 1982 Honda Accord 1600 Automatic, 1986 Ford Sierra XR4x4 and 2004 SEAT Leon Cupra 24V Turbo) had awkward boot-sills of one form or other, over which one had to lift one’s luggage; an undesirable feature shared by the Triumph Toledo’s close cousin, the Triumph Dolomite. The Dolomite’s extra boot space and additional 2•0 gallon (i.e. 9•09 litres) fuel-tank capacity would have been nice, but the boot-lid configuration and associated lack of a boot-sill was a clincher for me! Such was the ease of loading the Toledo’s boot, we could later slide in our 1973 VW 1600 Type 2’s flat-four air-cooled engine, to bring it home from my grandmother’s garage (where our VW campervan was stored) for overhauling. Last edited by naskeet on Tue Aug 30, 2016 3:26 pm, edited 1 time in total. Being a daily commuter (3~3½ hours per day), by bus, railway & underground-railway for a total of four years, during my studies at London University (3 years at Chelsea College & 1 year at Institute of Education), from October 1975 to June 1979, I only occasionally drove the Toledo during the weekends and university holidays. Hence, during the four-year period from May 1975 until June 1979, it only clocked up just over 8,000 miles in addition to the 4,133 miles which was on the odometer, when my father bought the car in May 1975. During the 1976 summer vacation, I got a short-term summer job working at the Research & Technical Services Laboratory, of Mobil’s Coryton oil refinery, in Essex, for which I was authorised to use the car to commute on a daily basis, as there were no viable public-transport options for my journey from Canvey Island to Coryton. 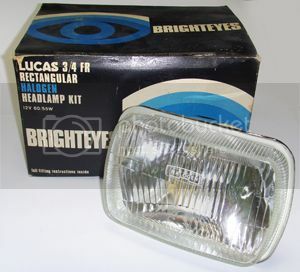 My association with Mobil, enabled me to obtain circa 30% trade discount at the local Lucas automotive electrical wholesalers, so I took the opportunity to purchase a pair of Lucas “Brighteyes” 7 x 5¼ inch quartz-halogen headlamp units, with which to upgrade the Toledo; also buying a pair of substitute 60/55W H4 quartz-halogen bulbs having P45t mounting flanges, with which to upgrade the 1973 VW Type 2 campervan, that my father had purchased second-hand in January 1975; just a few months before acquiring the Toledo. The original Lucas sealed-beam units were rated at 75/70W, but despite the 60/55W H4 quartz-halogen bulbs’ lower power rating the Lucas “Brighteyes” emitted a much brighter, whiter light than the original factory-fitted sealed-beam units, which gave good illumination on unlit rural roads, especially those equipped with “cats’ eyes”. For some reason that I never fathomed, the Lucas “Brighteyes” headlamp units, were equipped with H4 quartz-halogen bulbs having unusual P36t (instead of P43t) mounting flanges, which fitted into the lamp-units’ P45t bulb-recepticles by means of a P36t to P45t adapter. It was purely by chance that I later discovered I could instead use the relatively-cheap generic substitute 60/55W H4 quartz-halogen bulbs having P45t mounting flanges, and discard the special P36t to P45t adapters. Last edited by naskeet on Wed Sep 26, 2018 3:03 pm, edited 4 times in total. In circa April 1977, we received a letter informing us that the Toledo was subject to British Leyland Campaign Recall No. A041, regarding the replacement of a particular type of flexible front hydraulic brake hoses, which were found to be prone to premature failure. As a consequence of this, we returned to Mann & Egerton, the local Rover & Triumph dealership in Leigh-on-Sea, Essex, who inspected the car and determined that there was no immediate danger of the hoses failing. However, they would order new hoses of the chosen alternative type and notify us when they were in stock and available to fit to our Toledo. Imagine my surprise, when a few weeks later, we received a card announcing that the replacement brake hoses for our Dolomite Sprint, were now in stock! I have to admit that if only taking a cursory glance, our Toledo with its non-standard livery and alloy wheels, might have been mistaken by some for a Dolomite Sprint, but I would have expected a Triumph mechanic to know the difference! When we telephoned to inform them of their mistake, they assured us that the brake hoses were the same for both cars, so we made an appointment to have them fitted on 9th May 1977; on which date the car’s total mileage was only 8,543. Last edited by naskeet on Tue Aug 30, 2016 3:28 pm, edited 1 time in total. At the moment I have NO photographs at all, of my yellow & black, four-door, 1974 Triumph Toledo 1300 "HL"! At some time in the future, I might take some photographs using my 1979 vintage, Olympus OM2 single-lens-reflex, camera (35 mm film format) with inter-changeable OM-System lenses. Unlike many people, I do NOT possess a digital camera or mobile telephone of any description. I shall meanwhile explore whether I can plagiarise some similar representative images from other sources. I shall sporadically continue my write-up about my car and my experiences with it, as time and motivation permit. Knowing that lives depended upon my driving competence and skill, I had insisted that my original formal driving lessons, during early-1973 to mid-1974, should include as many road types & conditions as possible, plus adverse-weather and night-time conditions as well. Leaving “no stone unturned”, my instructor also insisted that I develop competence in reversing downhill around corners and other forms of complex manoeuvring in confined spaces; skills that were later to stand me in good stead, both in Great Britain and overseas. Sometime during the late-1970s (certainly before October 1979), I decided the time was right to further develop my driving skills, beyond the basic competence required for the ordinary driving test, which I had passed at the tender age of 18½, at the third attempt, on 1st July 1974. Preparing for the IAM – Institute of Advanced Motoring test and subsequent continuous membership fees, seemed prohibitively expensive, but the local Road Safety Committee, of Castle Point District Council, offered what was described as a “Driver Advisory Course”, at a modest fee, conducted at the local council offices’ building, by police driving instructors, from the Essex Police Driving School in Chelmsford, which also had a modest-sized skid pan. The theoretical “class-room” based part of the course, comprised narrated films and slide shows, plus an initial written test of our knowledge about the Highway Code, and recognition & interpretation of road signs. We were also given a personal copy of the police driving manual “Roadcraft” (upon which the IAM course was based), that I still have somewhere in the automotive & motoring section of my home library. I scored 100% on road-sign recognition, but only 95% on knowledge of the Highway Code (of which I still have a reasonably up-to-date copy; purchased in the public-library’s second-hand book sale), but this still placed me top of the class, in which only one or two scored more than 80%, and many scored less than 50%. It was stressed that the ability to quickly & accurately recognise & interpret warning, information and direction signs, was of paramount importance in quickly informing the driver’s decision of how to react to some of the hazards ahead. Although some aspects of this theoretical instruction, now seem to have been incorporated into the current piecemeal driving test (e.g. hazard-recognition videos), it was a revelation to witness how one could improve one’s observation skills to better anticipate what other road users (e.g. motor-vehicle drivers, motorcyclists, cyclists, horse riders, pedestrians and others) might possibly do next and be mindful of potential escape routes if the worst happened. They highlighted how information about junction layout and probable zones of visibility, could be deduced from direction road signs (white characters & symbols on a green rectangular background). Other important topics were: how to keep the car “balanced”; choosing one’s line through bends, roundabouts and other junctions; positioning the car relative to the road and other vehicles, to optimise zones of vision under all driving conditions and provide acceleration space for overtaking when both necessary and safe to do so. At the end of the theoretical course, we spent a whole Saturday, at the Essex Police Driving School. During the day, as groups of three passengers in the police cars, we accompanied A1-category police pursuit drivers, simulating pursuit driving (no sirens or flashing lights!) on the rural roads of Essex, as they gave a running commentary about their observations, plus what they were doing and why. We also had individual instruction in our own cars, on the Essex Police Driving School’s skid pan. Although at that time, I probably had more experience of driving the family’s 1973 VW 1600 Type 2 campervan (the first vehicle that I ever drove solo, in mid-1975, at the age of 19½), it was decided that the nimbler 1974 Triumph Toledo 1300, with its more precise rack & pinion steering, much smaller 29¾ feet turning-circle (between kerbs | bettered by few if any other cars, besides the London taxi’s 25 feet turning-circle) and better all-round visibility, would be more appropriate to initial skid-control training. It had always been impressed upon me that if I ever got into a skid, I should NEVER brake or declutch under any circumstances; relying solely on steering and throttle to re-establish control! When I first ventured onto the skidpan, my initial reaction to the feeling of increasingly light steering was to gently ease off the throttle, to avoid the likelihood of skidding; something I did instinctively without conscious thought. I was gently admonished by my police instructor who praised such a response in normal driving, but reminded me that I was actually trying to cause the car to skid, so that I could learn to control it after the event. He must have been reasonably impressed by my subsequent performance, because he later had me performing more advanced manoeuvres under controlled-skid conditions, which the other course members didn’t try. One manoeuvre I particularly recall, is that of undertaking a controlled skid in a semi-circular arc (akin to a technique used by rally drivers to quickly negotiate sharp bends at high speed, in rear-wheel-drive cars), using a combination of throttle and opposite steering lock, followed by termination of the skid to re-establish normal steering control and negotiate a slalom course of traffic cones and then re-initiate the controlled skid in a semi-circular arc, to again repeat the exercise. It was a useful and very enjoyable exercise! I cannot take all of the credit, for the successful completion of my skid-control training. I believe the Toledo’s light, sensitive, precise steering, combined with the very progressive throttle, made it so much easier to achieve. I don’t know whether I could have done it as well, driving other cars! During the winter of 1978/79, when I was on teaching practice at Abbs Cross School (an 11~18 year age-group secondary school) in Hornchurch, Havering (an eastern borough of Greater London), the non-availability of train services one day, obliged me to drive there in the Toledo instead. For reasons that I cannot recall, this involved driving along the narrow country lane between West Horndon and Upminster, which had a severe camber and was completely covered with slippery, hard-packed snow. Although driving at a modest speed, the car started to fishtail at some stage; the car’s rear noticeably oscillating from side to side. I immediately responded by gently easing off the accelerator pedal by only a few millimetres, which instantly suppressed the fishtailing and restored stability. I have yet to find any turning-circle specifications, for the other small 1960s to 1980s Triumphs, such as the Dolomite, Herald & Vitesse, Spitfire & GT6 and TR-Series. 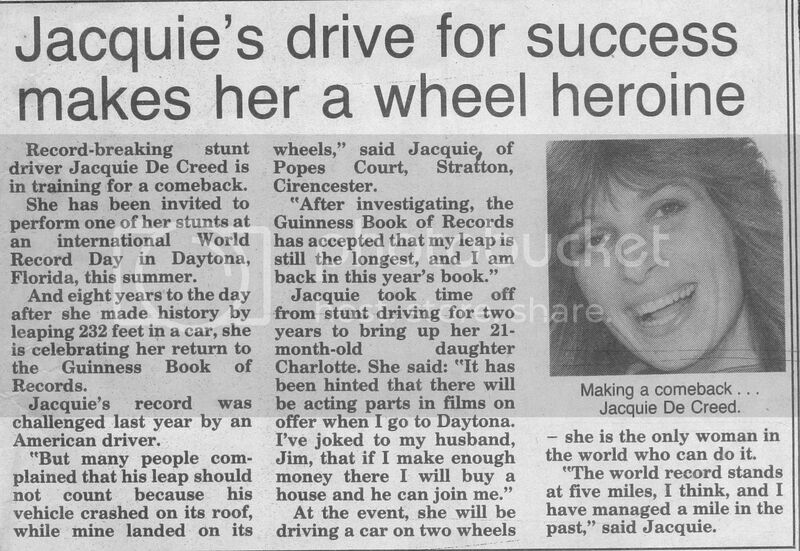 In 1991, I came across the following article in a newspaper (whether local or national, I cannot recall), about stunt-driver Jacquie De Creed, of Popes Court, Stratton, Cirencester, who was said to be the only woman in the World, who could drive a car on two wheels. Eight years earlier in 1983, she was included in the Guiness Book of Records, after setting a new record of 232 feet (i.e. 72 metres) for the Long Distance Car Ramp Jump, in a specially prepared Ford Mustang, having approached the jumping ramp at 140 mph. 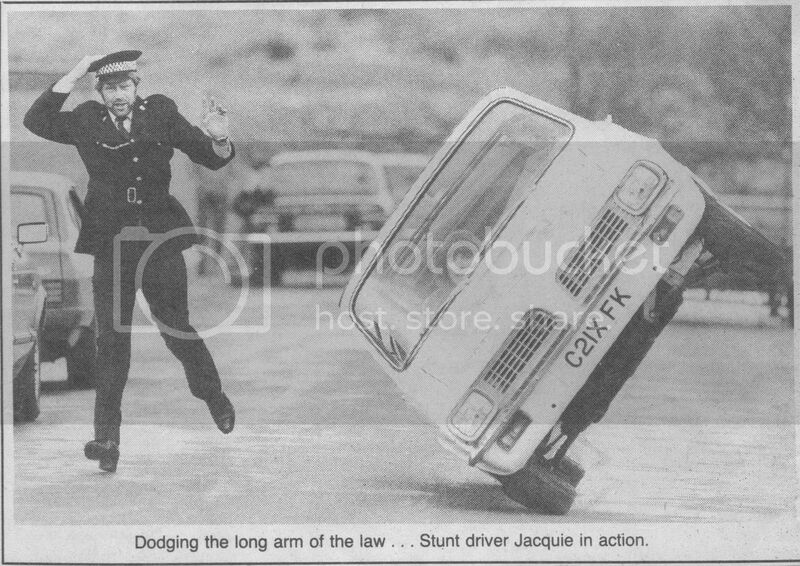 The photograph which accompanied the newspaper article, implies that her car of choice for driving on two wheels, was either a Triumph Toledo 1300 or Triumph Dolomite 13/1500 (although the car’s C-prefix registration number suggests the latter), and she claimed to have managed a distance of one mile doing this in the past. Needless to say, the advanced driving techniques covered by the Essex Police Driving School instructors, during our “Driver Advisory Course”, did NOT include either of driving on two wheels or ramp-jumping a car! Last edited by naskeet on Thu Sep 22, 2016 3:24 pm, edited 2 times in total. By the autumn of 1978, I could no longer keep repair-patching the original factory-fitted rear exhaust silencer & tail pipe with Gum Gun exhaust-system putty and other materials, so after four years and circa 10,000 miles, the rear exhaust section, was replaced at a local exhaust centre, with a good-quality stainless-steel one, made by Grundy. By the autumn of 1982, I similarly concluded that I could no longer keep repair-patching with Gum Gun and other materials, the expansion box of the exhaust-system’s central section. The Grundy stainless-steel rear exhaust section, was still in excellent condition and the front pipe section connecting to the engine’s cast-iron exhaust manifold, exhibited no noticeable signs of deterioration. Consequently, we tried to obtain just a stainless-steel central section, but Grundy no longer manufactured stainless-steel exhaust-system sections for the Triumph Toledo and we could find no suppliers, of any brand of stainless-steel exhaust system, who would sell us just a central section on its own. 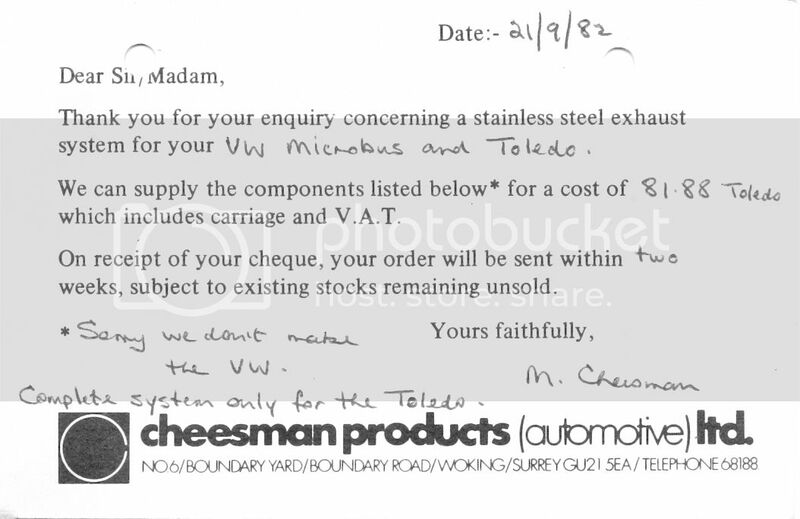 Hence, the only solution was to buy a complete stainless-steel exhaust system, which we obtained by mail-order from Cheeseman Products (Automotive) Ltd, for the princely sum of £81•88 inclusive of carriage and VAT. As things turned out, it was fortuitous that we also had the new stainless-steel front pipe section, because we were unable to remove the badly corroded central section, without irreparably damaging the original factory-fitted front pipe section; necessitating its replacement too. However, this in turn created another problem, because one of the nuts, holding the connection-flange of the front pipe section onto the engine’s cast-iron exhaust manifold, had seized onto one of the screw-studs as a consequence of corrosion. Despite liberal use of penetrating fluid which was allowed time to soak in, later followed by heating with a blowlamp, the nut would not budge and the screw-stud finally sheared off. Consequently, the sheared-off screw-stud was drilled out and an ordinary bolt used instead. Although I would have preferred stainless-steel exhaust-pipe clamps as well, the best that were available, were zinc-plated mild-steel, which needed to be replaced every few years. Likewise, the moulded-rubber exhaust hangers (e.g. Pearl Products) gradually perished, necessitating periodic replacement. Whether one can now obtain stainless-steel exhaust-pipe clamps and/or more durable exhaust hangers, I have yet to discover. Apart from these things, the complete stainless-steel exhaust system was virtually maintenance-free, up until the time that I took the car off the road in mid-1999, just over 17¼ years ago. Last edited by naskeet on Wed Sep 14, 2016 3:46 pm, edited 1 time in total. Whether one can now obtain stainless-steel exhaust-pipe clamps and/or more durable exhaust hangers, I have yet to discover. For the former you have a choice of better designs available in SS, however I am thinking you will need to separate the exhaust sections to facilitate fitting. For the latter, they modern polyurethane types may cause increased noise levels? It's been nearly two years since I posted anything in this topic thread; mainly because my home computer led me to believe that my file with many "pages" of further reading, had been corrupted in some way. Fortunately, I very recently managed to resurrect the file, so I shall now continue the saga. By the late-1970s (I have no written records of this, so am recalling vague memories! ), I had installed a pair of Kangol “Magnetic”, lap & diagonal, static rear seat belts in the 1974 Triumph Toledo 1300, employing the car’s already provided rear seatbelt mountings. Retro-fitting and using rear seat belts, provided greater crash protection for both the rear-seat and front-seat occupants. In circa 1975/76, I had previously installed three static rear seat belts in my family’s 1973 VW 1600 Type 2 campervan, where rear-seat passengers were especially vulnerable; completely unrestrained and surrounded by campervan-furniture with hard surfaces and projections. The obligatory installation of rear seat belts in new cars, wasn’t introduced in Great Britain until as late as 1987. Despite this, my father’s 1977 Honda Civic 1500 Automatic and later 1982 Honda Accord 1600 Automatic, both had factory-fitted rear seat belts, which any rear-seat passengers habitually used. However, his ex-demonstration, 1986 Ford Sierra XR4x4 hatchback, bought in 1987, that had optional factory-fitted ABS brakes and air conditioning, did not have factory-fitted rear seat belts, which he had retro-fitted by the local Ford dealership, before accepting delivery of the car. Mounting points for rear seat belts, already existed in the 1973 VW Type 2 campervan, 1974 Triumph Toledo & 1986 Ford Sierra XR4x4, so I presume they were not factory-fitted, solely for reason of cost. I later retro-fitted rear head-restraints to his Ford Sierra XR4x4, having learned that they were factory-fitted to the Ford Sierra Ghia hatchback, so surmised that such an upgrade to other Sierra hatchbacks would probably be quite straight forward. I would also like to retro-fit rear head-restraints to both the Triumph Toledo and VW Type 2 vehicles, if and when I can find a way to do it!?! From a newspaper article and a motoring book (i.e. AA Book of Driving, The Automobile Association, 1980, ISBN 0-86145-021-3 | Chapter 16 – Living with the Car, Safety Accessories Section, Page 172), I later learned of inertia-reel, automatic rear seat belts, which offer scope of greater diagonal-strap adjustability, for adults and children of short stature. The first of these was the Kangol “Generation” seat belt, which is probably now out of production, but in more recent years, there has also been the Securon “All Ages” seat belt, which might still be readily available. I have no children or grandchildren, so there has been little if any incentive for me to substitute either of these! In common with the Kangol "Generation" rear seat belts, these Securon "All Ages" rear seat belts have an adjustable diagonal strap for optimum comfort and safety of adults and children of short stature. In common with the Securon "All Ages" rear seat belts, these Kangol "Generation" rear seat belts have an adjustable diagonal strap for optimum comfort and safety of adults and children of short stature. In recent years, some modern cars have been equipped with rear seat belts which incorporate an air bag that deploys if deceleration exceeds a certain limit detected by accelerometers within the vehicle. 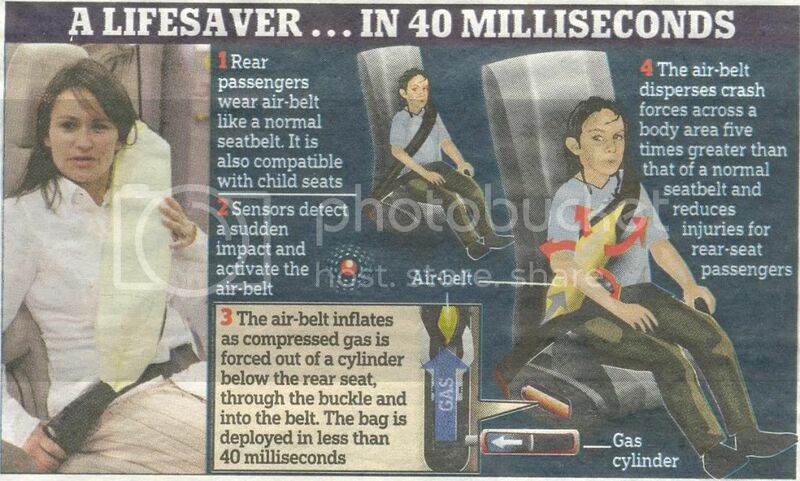 Similar seat belts with integral air bags are also fitted to some civil aircraft. Whether or not it would be practical to retro-fit such seat belts to older vehicles, I have yet to discover.